Hi everyone! It's that time of year when we look back to see what projects were among the most popular and do a round-up of the favorites. I've always tried to create projects that are inexpensive and easy to make. Most were repurposed, recycled, upcycled, projects that highlighted using everyday items like bottles, ribbon, paper, wire, natural fibers and even hot glue. 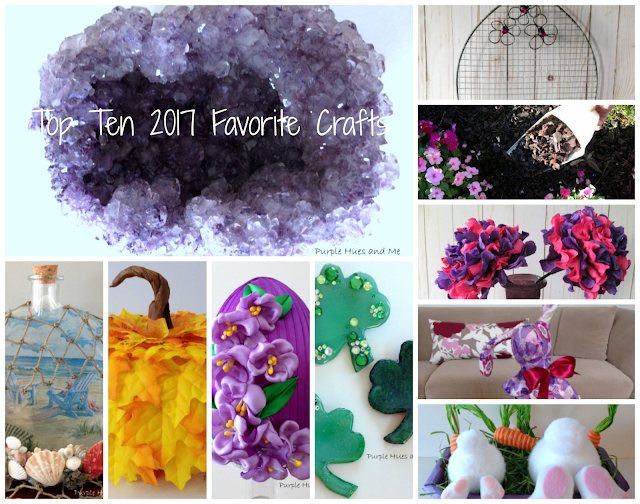 As we say goodbye to 2017, I would like to thank each and everyone of you in this wonderful blogging community for your interest, encouragement and support in my crafting adventures. I appreciate all of you and wish you the very best in the coming year! Have a great 2018! It's going to be amazing! Gail you are so good at these crafts. Fun to look back and remember many of your projects like this. My favorite is the reverse decoupage bottle with shells! Wishing you a Happy New Year with lots more crafting! I should need to use each subject from this site. In these subjects I have found such an expansive number of strategies and they are making package of organizations. All that I have examined from these web diaries, and an obligation of appreciation is all together to refresh those organizations.